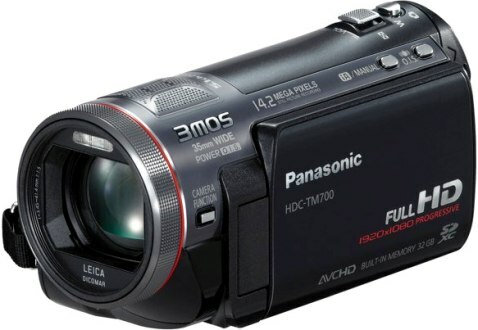 One of the market and technology leaders in consumer electronics, Panasonic has expanded its 2010 line of camcorders with the new Panasonic HDC-HS700 and HDC-TM700 full HD 3MOS camcorders, which able to shoot 14.2 megapixel still photos and full HD (1920 x 1080 resolution) video at 60 frames per second (fps), featuring an advanced 3MOS system, 3″ touch screen, Power O.I.S., newly designed 35mm wide-angle Leica lens and manual ring for creative flexibility. What’s the differentiate between Panasonic HDC-HS700 and HDC-TM700? Panasonic HDC-HS700 records to its large 240GB HDD that able to store 102 hours of video recording in HE mode, while Panasonic HDC-TM700 incorporate 32GB built-in Flash memory that can save 13 hours and 40 minutes of recording (HE mode). In addition, both Panasonic HS700 and TM700 have a SD/SDHC/SDXC memory expansion slot for added storage capacity. 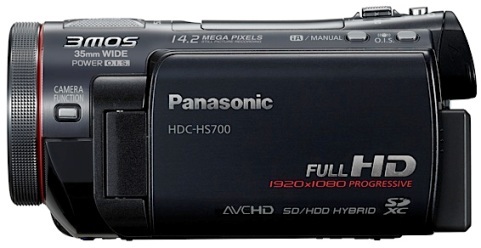 The new Panasonic HS700 and TM700 HD camcorders that includes 5.1-Channel Surround Sound System with Zoom Microphone will be available in black color, and the pricing and launch date have yet to be announced. Update: Panasonic HDC-HS700 and HDC-TM700 are scheduled to hit the market by mid-April for around $1,400 and $1,000, respectively.